I haven’t posted in a while. Life got in the way – mom started a downhill slide in April 2017, and she passed away peacefully in her sleep in June. Understandably, I took a break from blogging. But, I vow to continue this series of my moms recipes to honor her and eventually put them all in a recipe book for her family. This is a pretty simple one – CHICKEN MANDARIN. You can adjust some of the spices for your taste (I added garlic and left out the celery. You can upload the recipe here. Next up will be a recipe for a Sweet Potato Souffle – which isn’t really a soufflé, but that is what mom called it – as well as a great Baked Bean recipe. I am making them now for a family reunion. 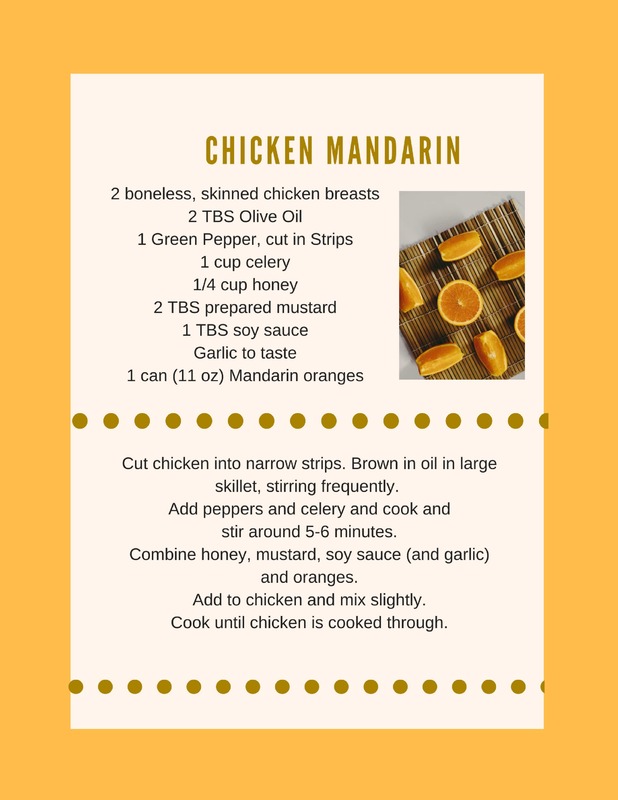 This entry was posted in Mom's Recipes and tagged Chicken Mandarin on August 19, 2017 by vickiemartin.